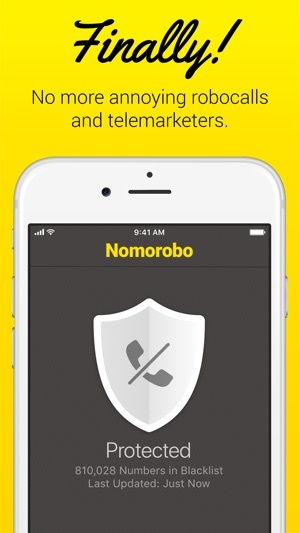 Nomorobo blocks annoying robocalls, telemarketers, spam texts, and phone scammers from calling your phone. Bring peace and quiet back to your life. Try it free for 14 days - only $1.99/month after. 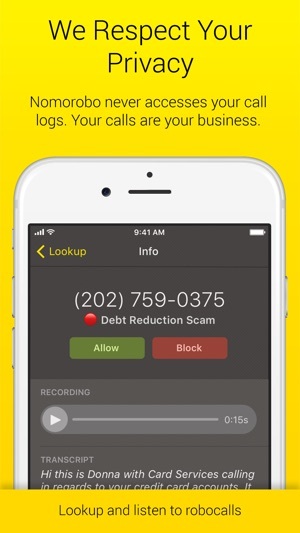 ## Featured by Apple as "New Apps We Love"
- Block "neighbor spoofed" calls. These are numbers that are very similar to yours. - New in v2.5! 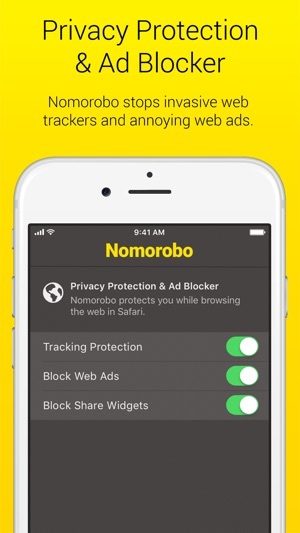 Block invasive trackers and annoying web ads. - All plans come with a 14 day free trial and cost $1.99/month or $19.99/year after that. - When purchasing a subscription, any unused portion of a free trial period will be forfeited. - Please don't swipe-up (aka quit) Nomorobo since it prevents us from refreshing in the background. - If you suddenly can't enable Nomorobo in Settings (it won't stay on), please delete the app, reboot your phone, and reinstall. This clears out an iOS caching issue and will get you back up and running. Better performance when handling background push notifications. This app simply does not work, and the people who make it are taking advantage of consumers by utilizing the increasingly common and unscrupulous tactic of charging on a recurring basis in a subscription model. I reached out to Nomorobo weeks ago asking if they plan on releasing an update to address to scourge of spoofed local numbers and haven’t received a response. Until this issue is resolved, the app is essentially a scam and in my opinion should be suspended from the app store. This company surely continues to benefit from customers who signed up for a subscription model who either forget to cancel before the auto-renewal date or aren’t aware this is an option. I set a reminder to unsubscribe and delete on the day before my subscription expires, and I’d suggest others who use this service do the same. Nomorobo needs to seriously reconsider their business model if it has any desire to reclaim consumer trust. 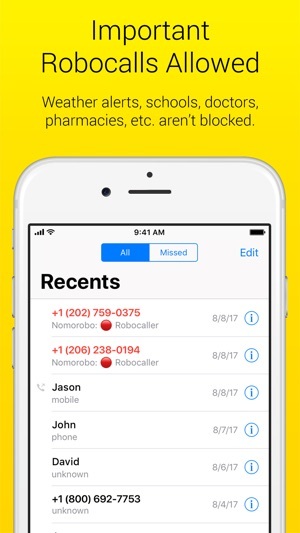 Until they do, WideProtect, a competing app that can be configured to block entire area codes, works very well and is available as a one-time purchase. 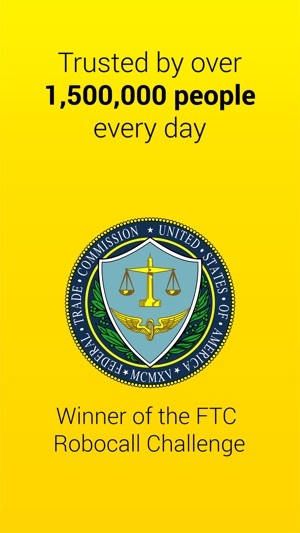 Is it the app or the FCC? My year subscription is about up and I'm not renewing. At first the app worked like a champ. But if you follow the tech news you'd have read about the FCC and the carriers trying to figure out a way too adapt and come up with standards to combat the cat and mouse game with these robo dialers and overseas telemarketers. 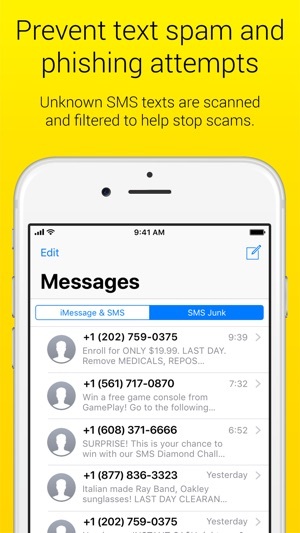 Unfortunately apps such as this are caught in the middle and are rendered pretty much useless since they rely on crowd sourced reporting of offending numbers and the companies hijack legit or use VoIP numbers to play the system. So I'm pretty much left to silence my phone and screen the calls via my watch. Sending unidentified numbers to voicemail and immediately responding to the legitimate calls until those in charge get their collective stuff together. Requires iOS 10.1 or later. Compatible with iPhone 5s, iPhone 6, iPhone 6 Plus, iPhone 6s, iPhone 6s Plus, iPhone SE, iPhone 7, iPhone 7 Plus, iPhone 8, iPhone 8 Plus, iPhone X, iPhone XS, iPhone XS Max, and iPhone XR.